I have had a new home office in the works for many, many months and I am thrilled that it is just about finished!!! I was very purposeful in my design of this office. I wanted an organized office that looked sleek and tidy. I wanted a modern look with rustic touches. It really is the little things that ended up making a big impact in the final look of my office. I’m excited to show you my favorite parts! This room started out as a completely unfinished room in our basement. We added an egress window and built it from the studs up! It had a cement floor and bare studs. I was so excited to pick out everything from the flooring to the trim! There are still a few unfinished things (like shelving, window treatments and wall hangings), but the majority of it is complete! It is the organized office I dreamed of and it has an absolutely calming atmosphere. When I sit in my office I can concentrate and work more efficiently because it is organized and calming. I wanted all of my storage to be sleek and hidden. 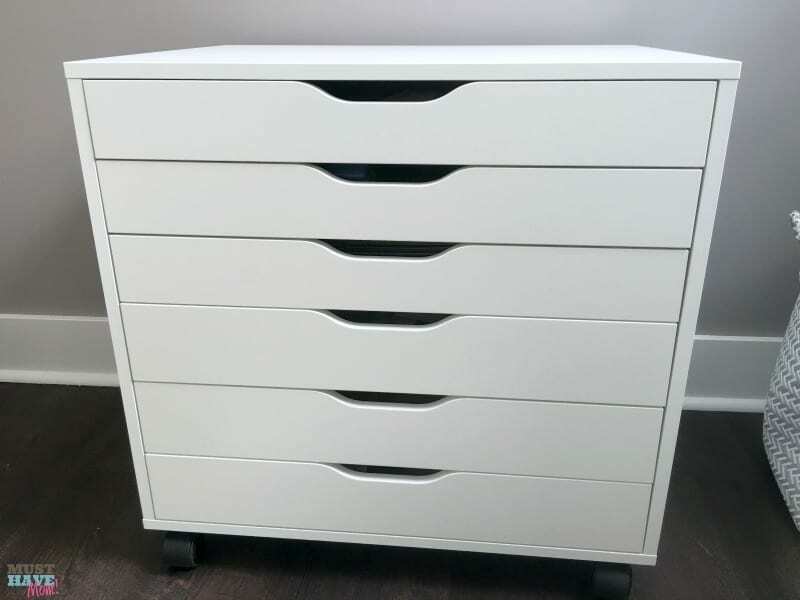 I bought this awesome drawer unit that is on wheels for all of my different paper storage. When I am not using it I can tuck it away under the desk unit. It matches the decor and fits right in. When I am working I can pull it out and turn it sideways and have extra counter space. It has multi-purpose functions! I shoot a lot of photos for Must Have Mom so I have a fair amount of camera equipment and lenses. 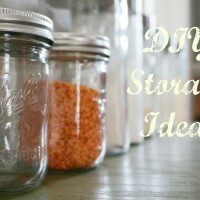 I wanted an easy way to move them around and store them in a readily accessible spot that looked pretty too. 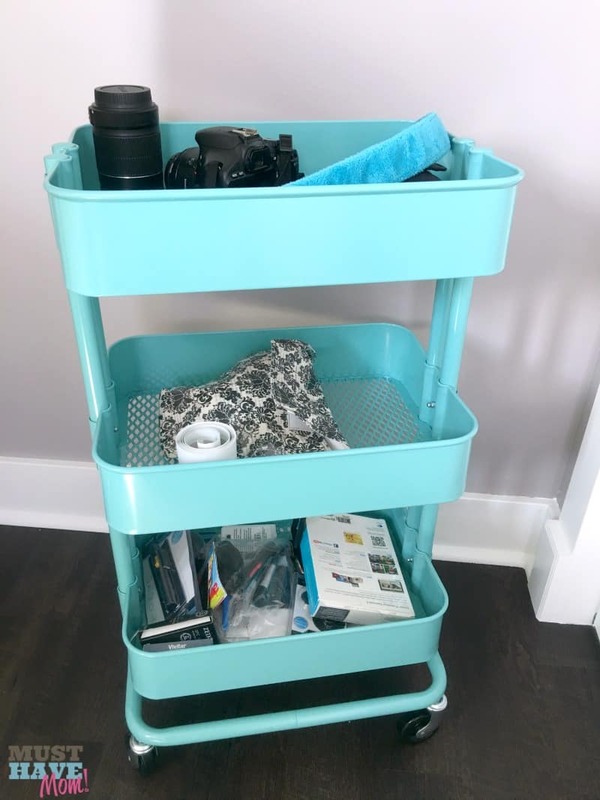 This IKEA cart was perfect and matched my color scheme. 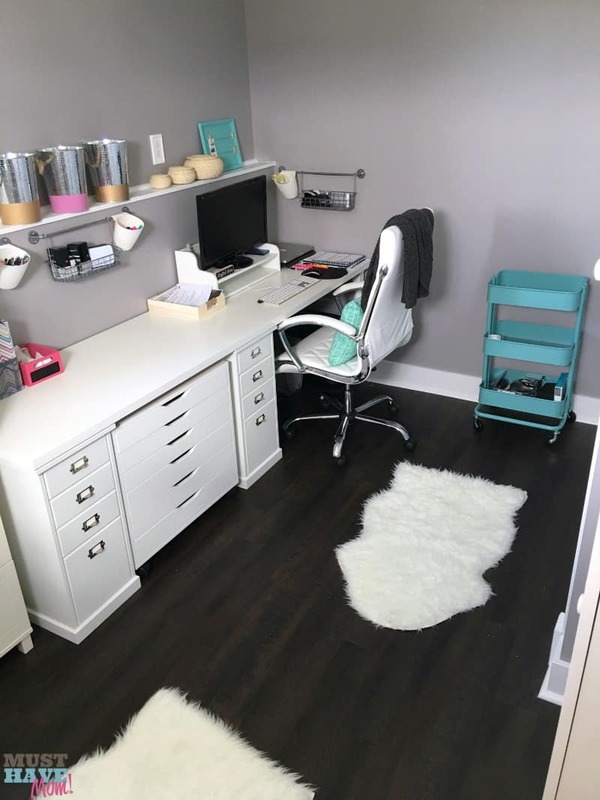 I also needed a crafting space as I create many crafts as part of my job here at Must Have Mom. 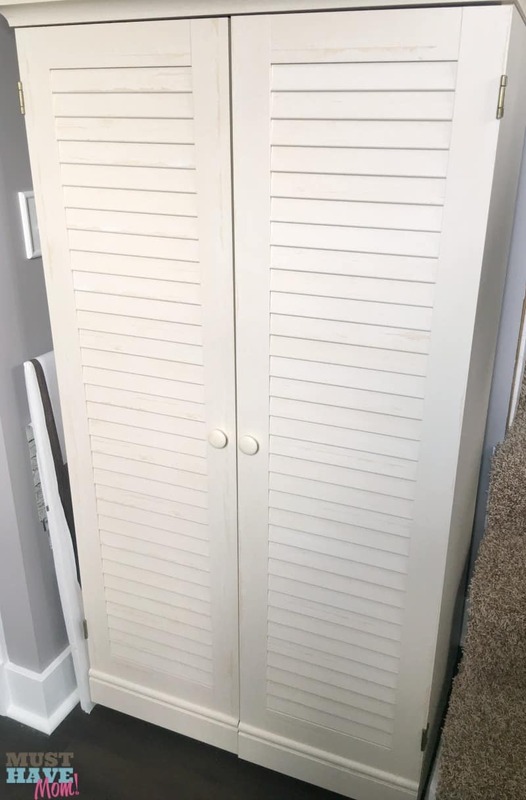 This craft cabinet was exactly what I was looking for. When it is not in use it is a neat, tidy looking cabinet. When opened up it reveals a ton of storage space for my sewing machine, serger, laminator, Cricut, lamp and extra supplies. I still have more room to add things too! I couldn’t believe how much fit inside. 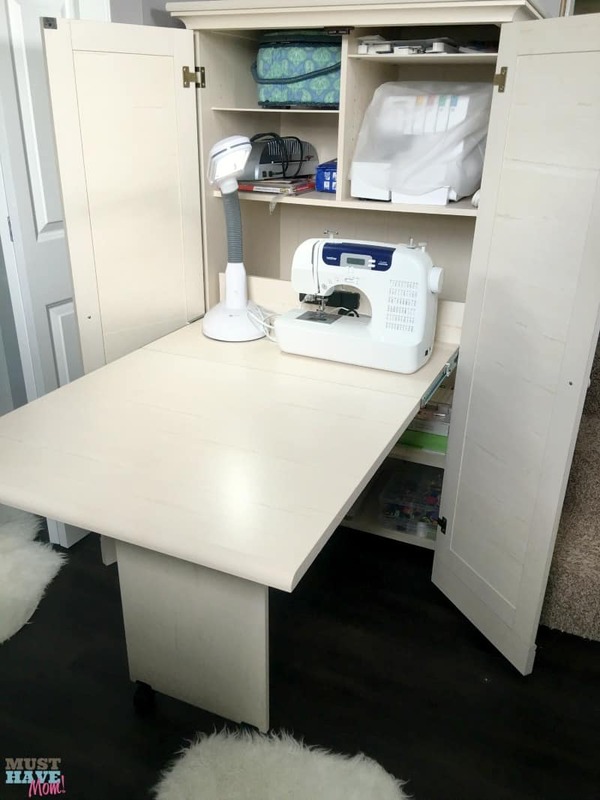 The thing I love most about this craft cabinet is that it has a pull out table so I have a dedicated workspace to my crafting that will also fold away when I am not using it. I knew I wanted a clean desk without a lot of clutter however I use a lot of different supplies throughout my day. 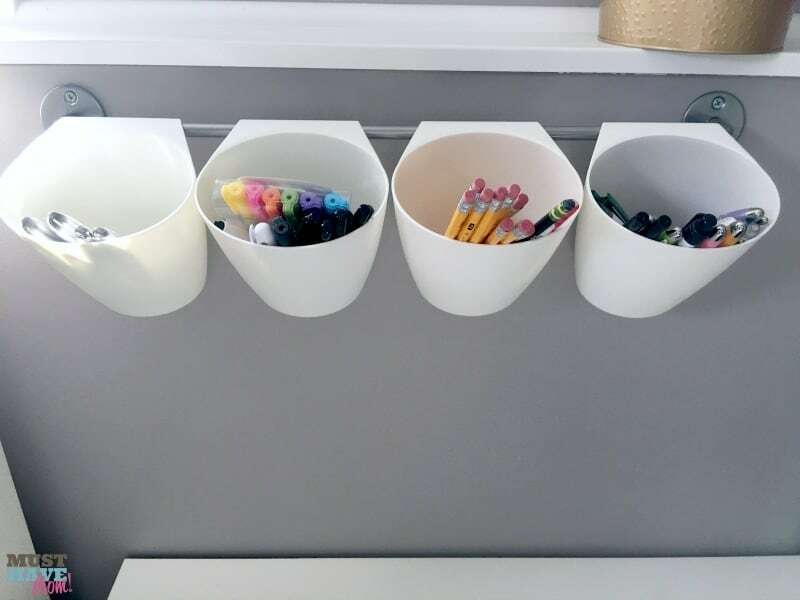 I solved that problem by hanging these bars with buckets to store all of my pens, pencils, highlighters, etc up and off the desk. I found these at IKEA as well. I also got a basket for one of my bars which serves to store my tape dispenser and stapler. One thing that many people probably don’t think of when decorating their home office is flowers! I treated myself to a subscription from BloomsyBox. 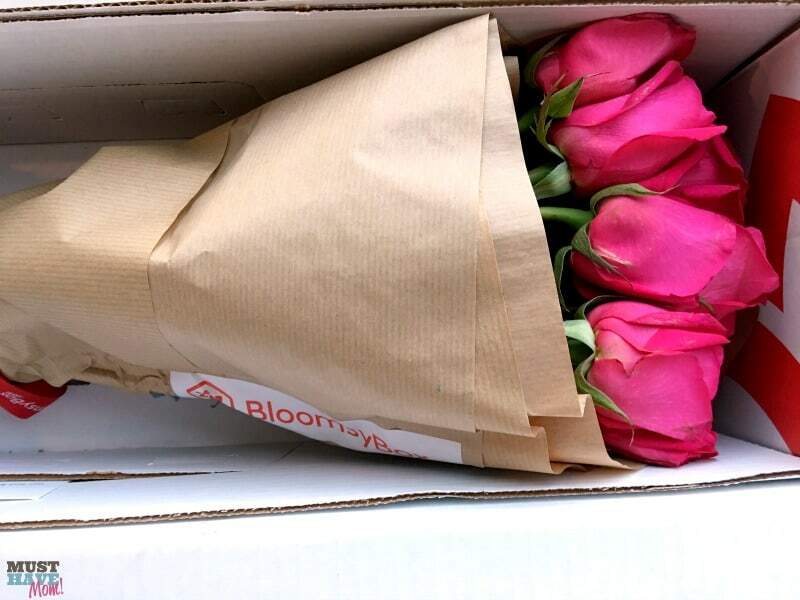 BloomsyBox delivers a handpicked single-variety bouquet to my doorstep each month! 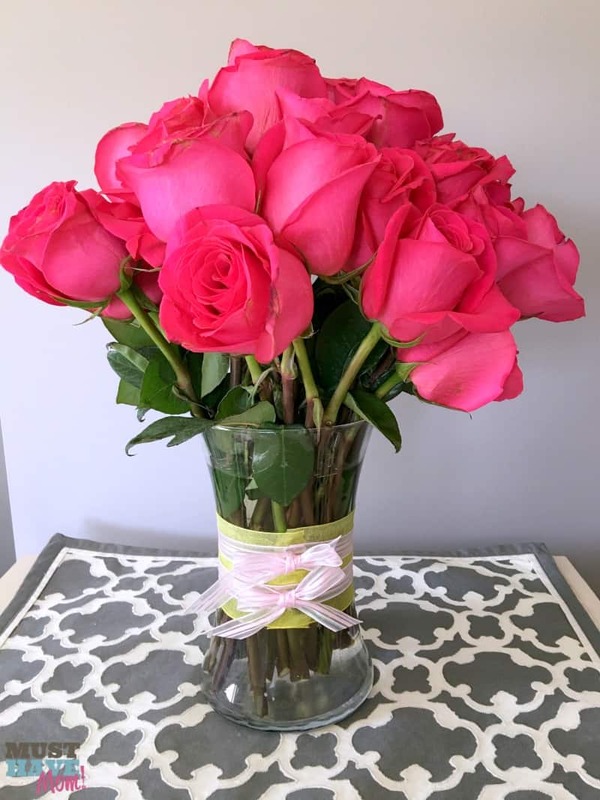 Since the flowers are sourced direct from suppliers in Holland, South America and California there is no middle-man mark-up to increase the price. The flowers are absolutely beautiful and they smell AMAZING!! I wish I could send the smell to you because I have never had a bouquet of roses that smelled so incredible. The fragrant smell fills my whole office and brightens my day. These little touches in my office make it so much easier to work each day. They brighten my office and make my day relaxed and happy. The flowers arrive in plastic-free wrapping and I just snip the ends off them and arrange them in a vase. They are always a single variety of flowers, with no fillers. You really end up getting a great value with the subscription. Who doesn’t want fresh flowers in their office regularly? Of course you may want to move them to the kitchen table when you aren’t working because they smell incredible. When you are away you can suspend your subscription too! Check out BloomsyBox subscriptions and varieties! I am so THRILLED with my new home office and I love all the little touches that came together to make a big impact! 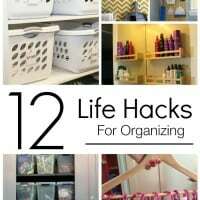 What is your favorite tip for an organized office or home? Do you have a little treat like my BloomsyBox subscription that you treat yourself too? « Huge List Of Things To Do This Summer To Prevent Bored Kids! I need to reorganize my office space! I have a draw that is ALL paper and honestly I don’t know what is in there. I will take a lot of these tips and use them. 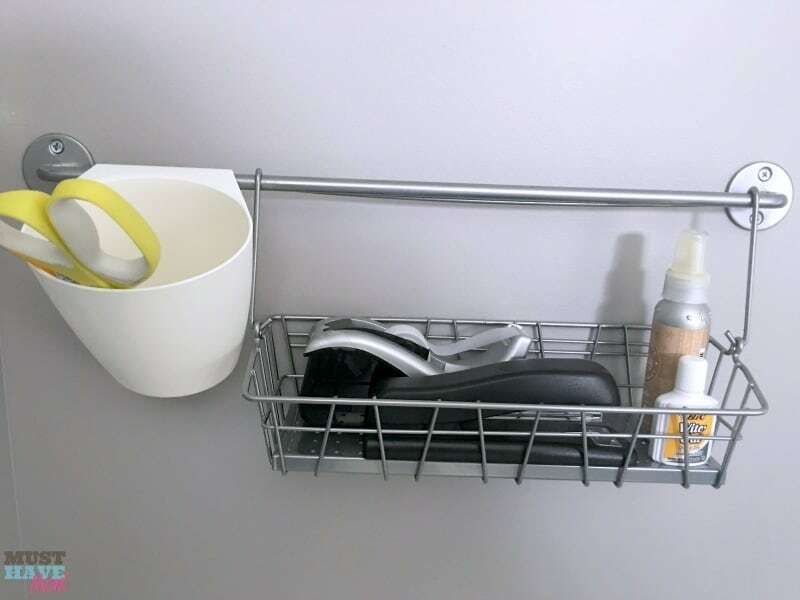 These are great organizational solutions. I struggle with keeping my desk tidy since I am working with such a small space. I love your organized office space! I need to organize my office better and really need to get that Ikea craft cabinet for all my craft and sewing stuff! It’d be nice to have it all in one area. I love organizing, especially my office. 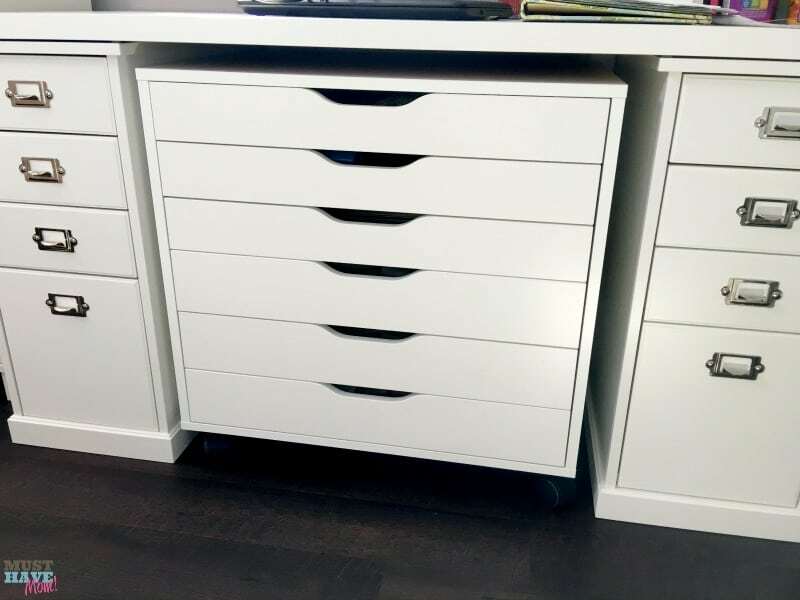 I need to go to Ikea and get more organizing cabinets and drawers. Love your office! 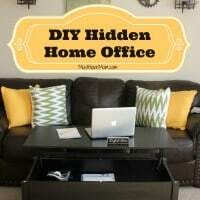 I am loving your organizational skills and all of the color, I bet this office is fun to work in and keeps you focused! 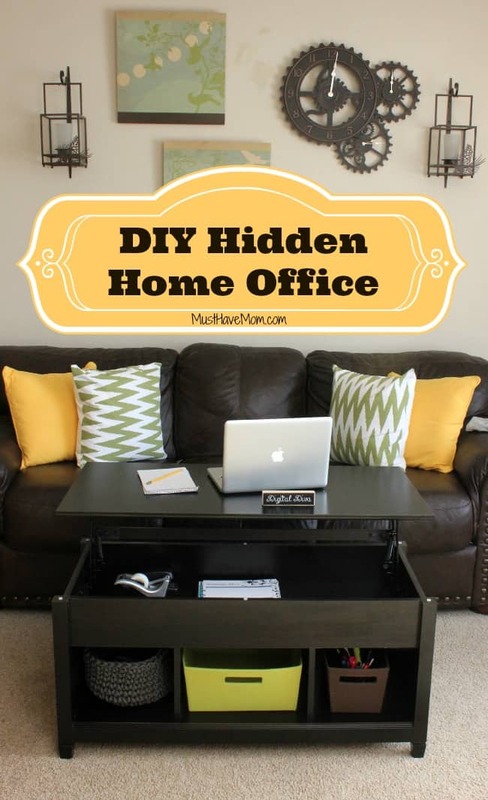 I love how this appears to be such an easy way to get organized and add some color to your office. I need to organize and decorate my home office so badly. It’s a clutter lately! Oh my goodness. I would love a room like this. It is my new happy place. I love this smart idea! We have a small office in home but it looks so messy, I’d like to follow this steps. That one was really fantastic, it’s amazing. Thank you. 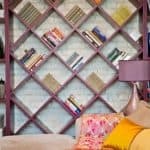 Storage spaces that could double as work spaces make all the difference in making sure everything looked tidy.